Double side Spinning plant, able to be configured with extruders up to 90/30, equipped with a spin beam filled with diathermal oil, able to have up to 6+6 Spinerettes with or without hydraulic split. Plant can be fully customized to fulfill your needs. Quencing system provided is Expero series with independent zones, on request air to air chiller can be provided. changing the position of the duals. The machine is equipped with a full digital automation system with a PLC and push buttons to manage the plant. 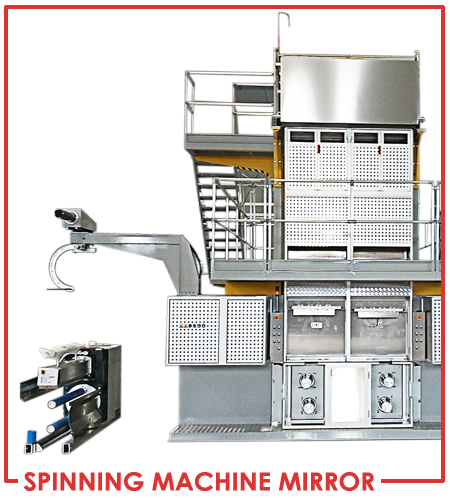 We have developed an easy and intuitive software to control the Spinning plant: extruder, Spinning head, Quencing, spin finish, draw section and air tangling unit are all managed from a touch screen. All the automation elements and the inverters installed onboard are first quality brands. The smallest Onmia mirror can be installed and put into production in four days.